Well I have been hoarding bits and pieces of these for ages. Technically the TamTech Lancia was my FIRST SEALED Kit that I bought myself back when new in 198something. :D It would seem now I have all the non F1 offerings of the original TamTech line. That said, I hope to have them all restored and with a chassis underneath each body you see here. I suppose it would be a good thing to have a radio set up for each one as well, too bad there are only 6 channels allowed for use here in the USA for 27MHz, but I suppose as long as I am not trying to drive them all at the same time, I should be safe. Keep your eyes to my showroom, perhaps by the end of the year I will have them all entered into their own posting with better, detailed photos. Coming at you. Keytag from Tamiya USA Display case bought at an antique shop, cheaply!!! Nice cabinet. Looking forward to see the cars all complete in their own showroom! Keep us updated! wow, you'll enjoy building them. That's one way to have a garage of super cars! 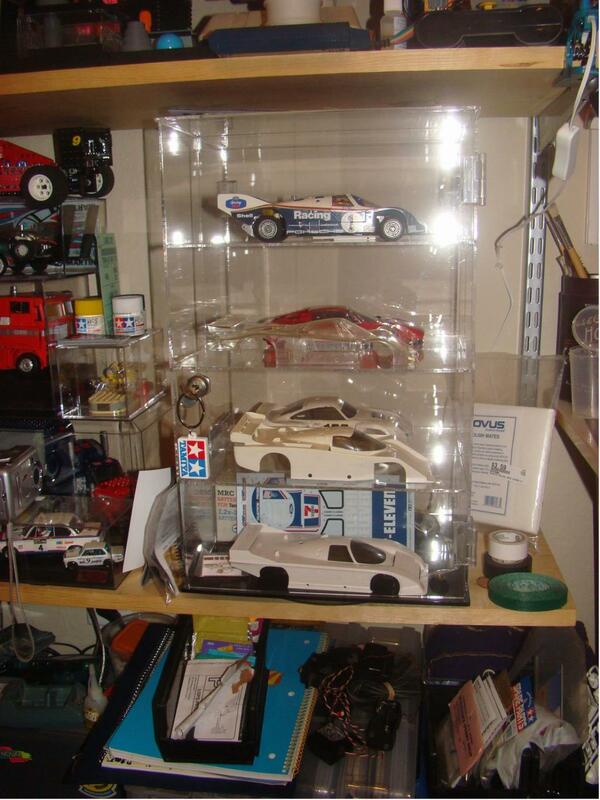 Nice collection.love the units youve got them in.i quite like to get a le mans style car one day.no where to use it around my area. Hey Crash,nice collection. The Tamtech models were kind of the 'unloved' lesser series that Tamiya bought out,but i still think they are fascinating models. Good going. Quality mate, love the collection!! all running on the same channel. with enough separation it WOULD work. would be kind of a gas. 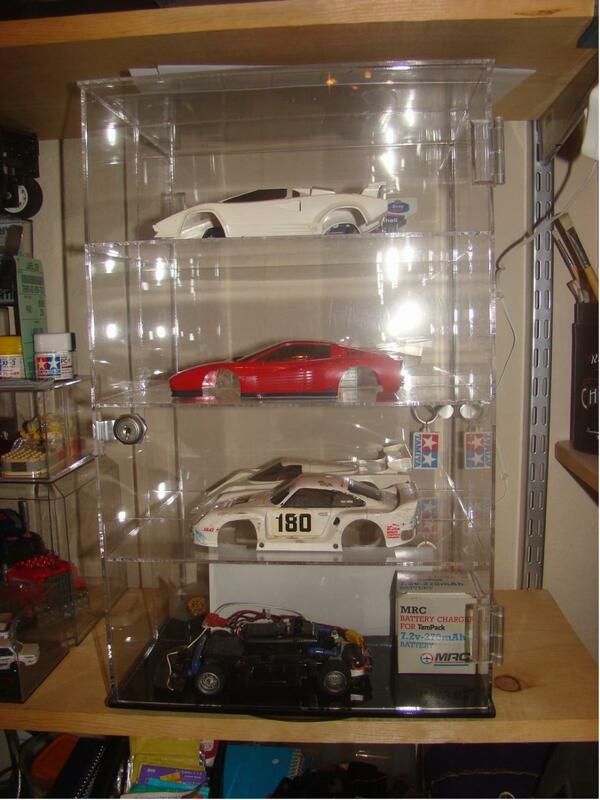 Nice collection Chris, I started out with the Porsche 962C as my first Tamtech and had the Lancia shell as a spare. When these came out I was in awe at how a hobby grade RC could be so small. One of my friends, friends got one and I was impressed at how fast they were for the size. Sadly I never ended up getting one but always admired them. Nice collection mate! Those small cars are really something else! And what a GREAT showcase!! Love it. 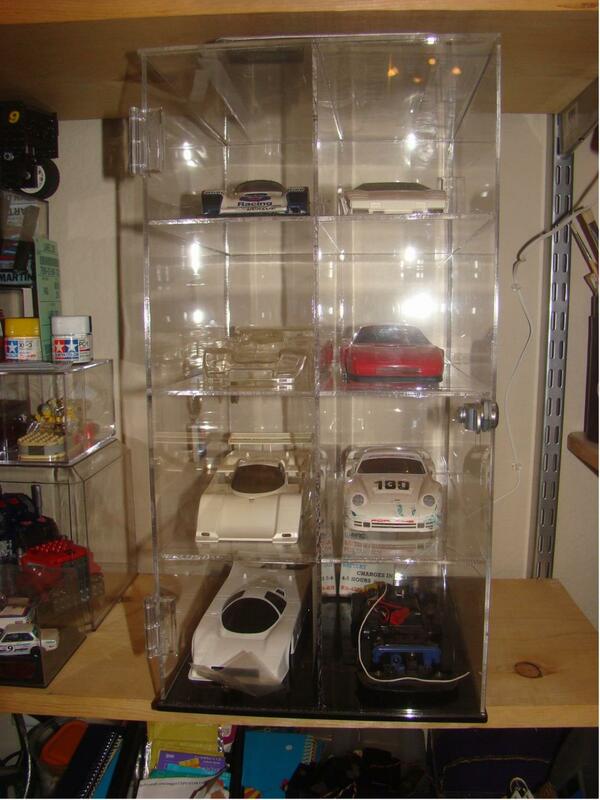 Thanks guys, the display case was a lucky find at an antique store, I scored it for about $40.